Do you know if your skin is getting all the yummy fatty acids it needs to stay healthy and glowing? See, oils provide our skin much needed fats, each unique in composition. 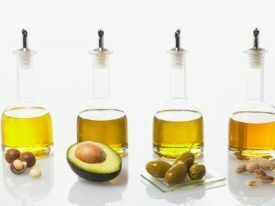 Our body doesn’t produce some of these fats, therefore are considered “essential” to intake through our diet and skin care. Linoleic, gamma linoleic, and oleic are all EFA (essential fatty acids) and are present in different amounts depending on the source. You can eat your EFA’s in the form of fats AND you can put them directly on your skin for lovely benefits. Essential fatty acids help to make your skin healthy, resist damage, and keep your skin hydrated and elastic. Ceramides make up about 50% of the outer layer of our skin! In the winter our ceramides decrease which can lead to itchy and dry skin. And, those with chronic inflammation of the skin (atopic dermatitis) and acne show lower levels of these fatty acids in their skin. Intrigued and wondering which oils contain the highest amounts? Grape seed oil has one of the highest amounts of linoleic acid in all oils – a whopping 72% linoleic acid! Once learning this (from the super knowledgeable Swiftcraft Monkey) I thought this sounded like a perfect base for an all over body oil. And, turns out after some experimentation, paired with complimentary carriers; jojoba wax, shea olea, and vitamin E the blend feels soft and silky to the skin. I FELL IN LOVE with this blend as an after bath oil and love the glow it leaves behind! First Touch was born! If you’re looking for skin care products that nourish and feed your skin look at the first few ingredients to ensure they are packed with essential fatty acid oils. It is empowering to understand how these ingredients from the earth can encourage and support beautiful, healthy, and radiant skin!